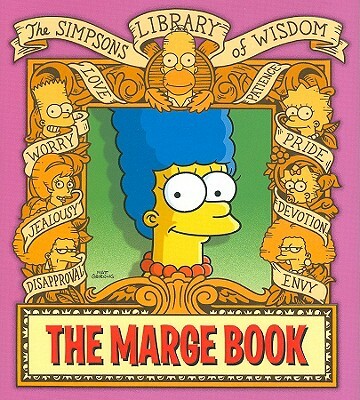 The Marge Book was released in hardback, as part of the ongoing series: The Simpsons Library of Wisdom. Marge Simpson, the woman with the impossibly blue and improbably high hairdo, is a complex woman with an inner life, hopes and dreams, and an incorrigible family that she holds together with a healthy homemade helping of common sense. Join the coupon-clipping queen of discount shopping at the nearby Sprawl-Mart, at a meeting of the school PTA, in the middle of a bodice-ripping romance novel, at a theatrical performance of her one-woman show, or in her crusade against cartoon violence, domestic strife, and suburbia's quiet life of desperation . . . or at least her desperate hope that no one will hold anything that Homer or Bart does against her personally. Modified on October 2, 2015, at 07:39.